Operation Beit HaShoevah to commence Tuesday morning in Sinai, where IDF officials will make initial contact with Gilad Shalit, and give green light for the immediate release of hundreds of prisoners. Surrounding vicinity to be declared closed military area. Approaching the moment of truth – The IDF, Prison Service and police are completing last minute preparations ahead of the prisoner exchange deal that will see the release of captive soldier Gilad Shalit in return for 1,027 Palestinian prisoners. According to the plan, Gilad’s first encounter with Israeli officials will take place in the Sinai Peninsula, after the kidnapped soldier will be transferred there from the Gaza Strip. Operation Beit HaShoevah, named after the special celebration held during the intermediate days of Sukkot, will begin immediately after IDF officials make initial contact with Shalit in Sinai. 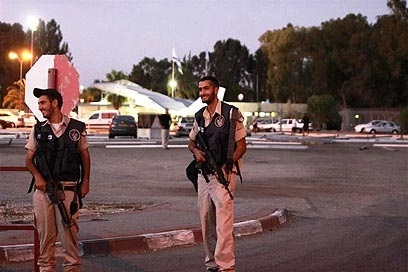 At that moment, Prison Service employees will release hundreds of prisoners, which will be divided in two main groups – some 100 prisoners will leave on Red Cross buses toward Ramallah, while a second, larger group, will be transferred to Gaza or deported abroad. According to the plan, Shalit will be transferred from Sinai to a military base in the south, where he will undergo initial medical examinations. From there, an Air Force helicopter will take him to Tel Nof airbase in central Israel, where he will first reunite with his family. In fact, the most critical moments of the operation are expected during the transfer of Shalit from Sinai to Israel via land. Only after his medical condition is verified, the IDF will make an official announcement regarding Shalit’s return to Israel. Following a short reception attended by Prime Minister Benjamin Netanyahu, Defense Minister Ehud Barak and IDF Chief of Staff Benny Gantz, the family will deliver a statement to the press at a media tent erected at the entrance to the base. From there Shalit will be flown to his home in Mitzpe Hila, where he will continue to be accompanied by military professionals. The Spokesperson’s office will take the first footage of Shalit in Tel Nof base and will hand it to media outlets in an orderly fashion. The IDF however is not ruling out the possibility that Shalit will be photographed by Hamas prior to his release on Tuesday morning. During the operation, the surrounding vicinities will be declared a closed military area, and will be closed to the public. The operation will be commanded by Head of the IDF Operations Division Brigadier-General Kobi Barak, under the supervision of Chief of Staff Benny Gantz.